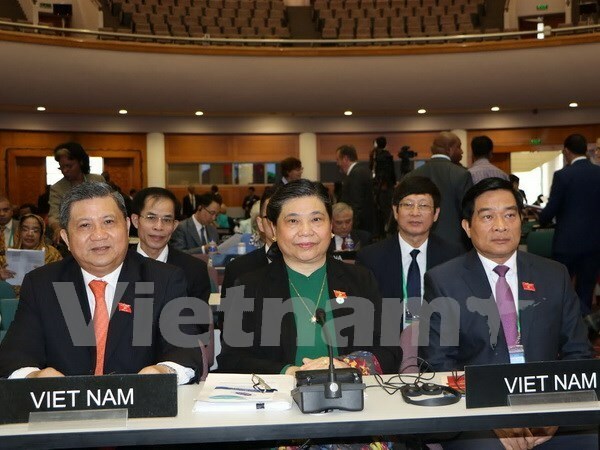 Dhaka, (VNA) – Permanent Vice Chairwoman of the National Assembly (NA) Tong Thi Phong attended the Governing Council meeting and the General Debate of the 136th Inter-Parliamentary Union (IPU) in Dhaka, Bangladesh on April 2. On the sidelines of the meetings, Phong met with Speaker of the Sri Lankan Parliament Karu Jayasuriya, during which she affirmed Vietnam’s consistent policy of treasuring its traditional friendship and multi-faceted cooperation with Sri Lanka. She proposed the two countries continue coordinating and supporting each other at multilateral forums, especially within the framework of the United Nations and the Non-Aligned Movement. She suggested maintaining the exchange of all-level delegations, studying measures to further increase two-way trade, and actively implementing the investment encouragement and protection agreement between Vietnam and Sri Lanka. She asked for early reply from the Sri Lankan side on a draft agreement on educational cooperation between the Vietnamese Ministry of Education and Training and the Sri Lankan Ministry of Higher Education and Highways. The Vietnamese official took the occasion to invite Jayasuriya to attend an IPU conference for the Asia-Pacific region in Ho Chi Minh City from May 11-13 to discuss legislators’ actions to realise the sustainable development goals in the context of climate change. Speaker Jayasuriya expressed his hope to intensify his country’s fine relationship, especially in trade, with Vietnam. On the same day, Phong met with Bangladeshi Prime Minister Sheikh Hasina. She said she hoped Bangladesh would continue creating favourable conditions for the two countries’ enterprises to seek business opportunities. Chairman of the Vietnamese National Assembly’s Committee for External Relations Nguyen Van Giau had a meeting with a delegation from the Parliament of the Republic of Korea.